Not only has El Portal received AAA’s Four Diamond rating, but was voted by Condé Nast readers and travelers as one of the top 50 small hotels in the USA. This is an amazing honor, (along with the AAA Four Diamond Rating) as the luxury inn only has 12 guest suites, serves only breakfast and has complimentary afternoon hors d’oeuvres (with honor bar). The boutique hotel does offer a unique lodging experience not found anywhere else. El Portal owners Steve and Connie Segner want guests to feel at home, to come and go as they please, with as much or little assistance as is requested. It is not a large resort, nor is it your typical bed and breakfast. 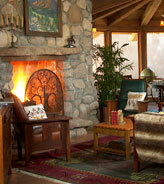 It is a pet friendly hotel, located in the heart of Sedona. To the Segners, there was no question that an upscale, luxury inn could provide style and the best amenities for guests and their pets. According to the readers of Condé Nast Traveler El Portal has achieved just that. With the majesty of the red rocks of Sedona and the surrounding countryside El Portal is just steps from biking paths, cultural events, hiking trails, shopping and dining, and has its own jeep tour company. The pet friendly bed and breakfast offers personalized concierge services to guests from planning Grand Canyon adventures to wine tours to hot air balloon rides, the sky is truly the limit. When planning your next Sedona Arizona vacation remember the advice of Condé Nast travelers and make El Portal Sedona Hotel your hotel of choice.